If sand is the key to how Fraser Island was formed, then water has been the reason it has become so special. The combination of environments, particularly the rainforests, have established Fraser Island's wealth of freshwater sources. Crystal clear creeks and streams flow through the cool, shady forests and out into the sheltered waters of Hervey Bay on the western side of the island. Along the shore, hundreds of streams run down the smooth, sandy beach and into the ocean. But of all the creeks and streams on Fraser Island, two stand out as exceptional. Wanggoolba Creek at Central Station flows silently over white sand along the floor of a thick rainforest. A major port of call for visitors, Wanggoolba's creekside walkways pass the angiopteris ferns, an ancient species boasting the largest single fern fronds in the world. Eli Creek (left) on the eastern side of Fraser Island, is the largest of the freshwater streams flowing into the ocean. Eli is popular with visitors and walkways allow you to appreciate its beauty. Stop for a while and spot the kingfishers as they dart amongst the pandanus and casuarinas. It would be hard to imagine lakes clearer than those on Fraser Island. The water is so pure that the 40 or so lakes support relatively little life. There are three types of lakes on Fraser Island: window, barrage and perched lakes. Window lakes occur when the ground drops below the water table. The fine white sandy base acts as a filter, giving the water its clarity. There are several window lakes including Yankee Jack, Ocean Lake and Lake Wabby. Lake Wabby is also termed a barrage lake, which is formed by the damming action of a sandblow blocking the waters of a natural spring. Wabby is relatively close to the ocean side of the island and unlike the other lakes it supports several varieties of fish. It is also a good example of the sandblow phenomenon, gradually encroaching on the deep green waters of Wabby as the sandblow makes its gradual progress westward across the island. Perched lakes occur above the water table. Saucer-shaped depressions with a hard, impervious base of organic matter and sand, form a catchment for the rain eventually creating the lake. The peat-like base generally stains the water the colour of tea. 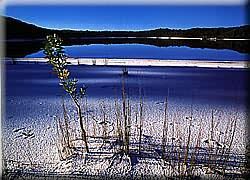 In the northern half of Fraser Island, Lake Bowarrady is the highest of the perched lakes being some 120 metres above sea level. In the southern part of the island there is Lake Birrabeen and the popular Lake McKenzie (left). Lake Boomanjin at approximately 190 hectares in area is the world's largest perched dune lake. Each of the lakes has its own particular character. Mysterious, moody and beautiful, they are excellent subjects for photography, great places to see birds, other fauna and flora and a welcome oasis on hot summer days. Scenic 4WD circuits and walking tracks in the southern half of Fraser Island take in some of the largest of the lakes including McKenzie, Birrabeen, Benaroon and Boomanjin. There is a walking track to Lake Wabby from the beach. [Photographs on the Fraser Island pages are by Paul Candlin, Darren Jew, Greg Teschner, Terry Harper, Steve Parish, Colin Rayfield, Damian McGreevy, Darren Leal, Janet Marles, E. Smith, J.Gray/Nature Focus.